Hanging scale with mini, micro and normal A type USB port, ensures zero data lose error. It also connects to PC, TAB, and any mobile with micro USB port. Compatable with Android, Lollipop and customization with OS also possible. Ideal for tea garden, commercial / industrial weighing, dairy, hatcheries and educational applications. USB Port for PC connectivity. 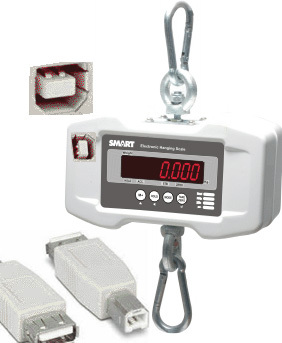 Battery charger make it a very useful hanging scale. Anti-vibrating swing intellectual digital filter. Instant taring, and delayed taring. It also has an over-discharge protection circuit.